Francesca was born in Japan and raised all over the United States. Due to her father being in the military, Francesca has gone to at least 10 different schools, graduating college in Florida. She worked with a major airline for more than 10 years. Traveling is definitely a part of her life. In 1988 she married Alain San Giorgio, a count and formerly a fashion designer of Monte Carlo, Monaco. 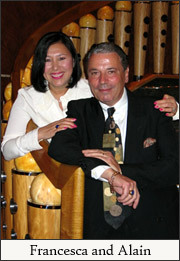 Francesca has lived in Europe, USA, and the Philippines and has traveled all over the world for business and pleasure. She now resides in Virginia with her husband and daughter and sells real estate for a local company, Four Seasons Realty. Francesca's energies and enthusiasm for life are contagious. She demands a lot from herself, giving to others her passion for excellence, her specialties are condos, homes, farms and land. Conte Alain San Giorgio traces his family back more than 700 years, one of the oldest families in the principality of Monaco. Fluent in French, English, Spanish and Italian, he served as Monaco's ambassador to the 1984 Monaco Olympic committee in Los Angeles. His father was Minister of education, charge de mission, and a close friend of SAS Rainer III, Prince of Monaco. At the age of ten, Alain assisted at the wedding of SAS Rainer III and Princess Grace Kelly. After graduating from the Lycee Janson de Sailly and La Sorbonne University in Paris, he took his first trip to New York on the Queen Mary. During his extensive international business career as a fashion designer spanning more than 30 years traveling around the world, he was the founder and President of Conte San Giorgio International, a Monaco based fashion, manufacturer and world-wide distributor of men's and women's exclusive apparel and accessories. In 1986, during his fashion show in Miami, he met Francesca, his beautiful companion. In 1999 they moved to Nelson County with their daughter Catalina and their seven Arabian horses.